The Tiger girls varsity basketball team opened their season against Red Rock Central last Tuesday. They defeated the Falcons 51-50. The girls also defeated the BLHS Mustangs 59-46 last Friday in Hector. Congratulations to Sydney Hauger who scored her 1,000th career point during the BLHS game! This week, the Tigers host Sleepy Eye St. Mary’s on Tuesday, December 4 and host GHEC-Truman on Friday, December 7. Best of luck to Head Coach Dillon Schultz and the Tigers in action this week! The Tigers opened their season with an exciting non-conference game against Red Rock Central last Tuesday evening in Springfield. The Tigers defeated the Falcons 51-50. In Tiger action, Sydney Hauger scored 22 points with 11 rebounds, 1 assist and 5 steals while teammate Mackenzie Lothert scored 14 points with 7 rebounds, 1 assist and 2 steals. Taylor Augustin scored 7 points with 5 rebounds, 1 assist and 2 steals while Samantha Richert scored 6 points with 4 rebounds, 1 assist and 3 steals. Courtney Wendt scored 2 points with 3 rebounds and 3 assists while Megan Ploeger had 4 rebounds, 2 assists and 1 steal. Meriah Kirschstein had 3 rebounds and 1 assist while Cylee Graff had 2 rebounds, 1 assist and 1 steal for the Tigers. The Tigers traveled to Hector to face the Buffalo Lake-Hector-Stewart Mustangs last Friday evening. The Tigers got the win, defeating BLHS 59-46. During the game, junior Sydney Hauger scored her 1000th career point. 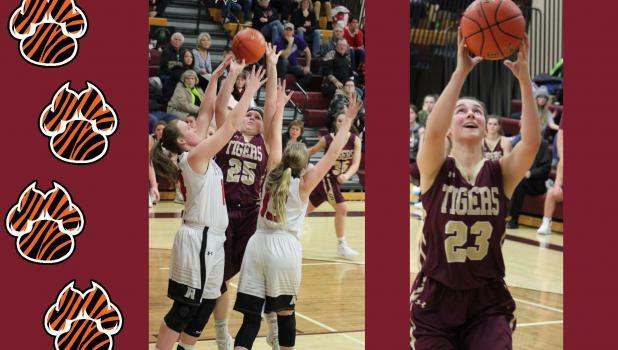 In Tiger action, Sydney Hauger scored 31 points with 7 rebounds, 2 assists and 12 steals while teammate Courtney Wendt scored 8 points with 6 rebounds, 5 assists and 1 steal. Taylor Augustin scored 7 points with 9 rebounds and 1 steal while Cylee Graff scored 6 points with 4 rebounds, 1 assist and 1 steal. Megan Ploeger scored 6 points while Meriah Kirschsein scored 1 point with 1 assist and 1 steal. Samantha Richert had 4 rebounds, 2 assists and 3 steals while Mackenzie Lothert had 1 rebound, 2 assists and 1 steal for the Tigers.